The Automata Blog: Mekanikos vs. The Minotaur carnival sideshow automaton featured on Boing Boing! Mekanikos vs. 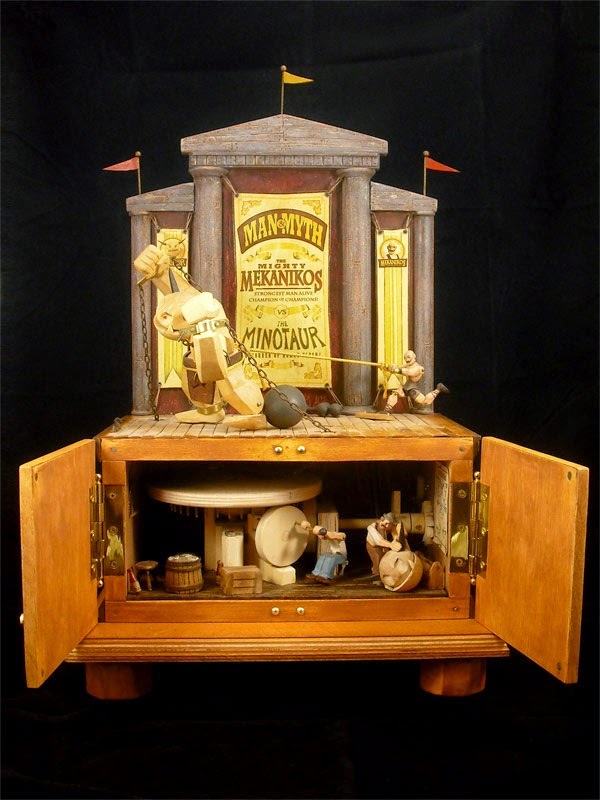 The Minotaur carnival sideshow automaton featured on Boing Boing! Recently, Mark Frauenfelder asked me to describe the process of making my automaton titled Mekanikos vs. The Minotaur. My write up was featured on the illustrious Boing Boing site yesterday along with a video of the piece in action and several detailed photographs. I couldn't be more fortunate. I won't repeat all that I said there because you can read the blog post on BoingBoing.net. I will add that I am very pleased with the final piece and that I'm happy to be offering it for sale to my existing customers and the public as a whole at long last. Oh if I had the funds! Wonderful piece, it's one of my favorite of the modern automata.